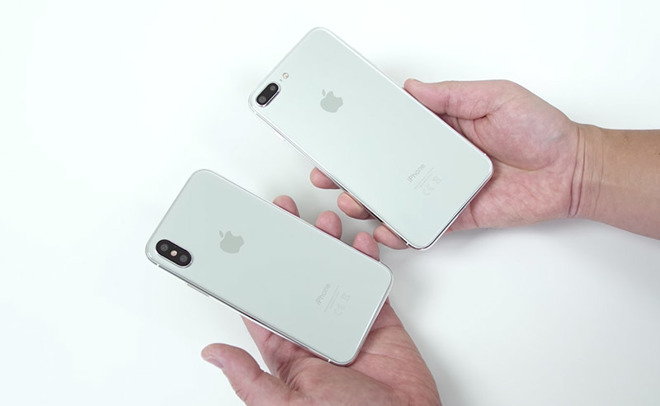 The latest batch of dummy "iPhone 8" and "iPhone 7s" series phones have apparently made their way out of China, as a pair of videos on Wednesday offer hands-on looks at what appears to be identical device mockups. In a first video, YouTube creator Danny Winget got his hands on what he claims to be an "iPhone 7s Plus" prototype, though the part is almost assuredly a mockup based on leaked CAD renderings and rumors. Like alleged "iPhone 7s" and "7s Plus" dummy units photographed earlier today, the mockups in Winget's video are emblazoned with "Conformité Européenne" (CE) and battery disposal iconography. Apple digitized regulatory markings with iPhone 7 in the U.S. and moved the icons to the "About" section in Settings, leaving only the "iPhone" logo above small text reading "Designed in California Assembled in China" and information regarding model number, FCC identifier and IC code. International models incorporate regulatory marks, but are much longer than simply "CE." While the dummy unit is probably a knock-off, its design could be based on legitimate schematics. Apple suppliers in China have been known to leak sensitive data, including final design molds, documents and internal components. As seen below, the "iPhone 7s Plus" dummy unit is expectedly similar to current iPhone 7 Plus hardware in terms of component positioning, bezel design and dimensions. The only obvious difference is a glass back, which appears to sport thinner antenna lines than existing iPhone models. Apple is anticipated to employ a glass chassis in all 2017 iPhone models to facilitate wireless charging. Winget goes on to compare the "7s Plus" against a supposed "iPhone 8" unit, illustrating the extreme deviation in display size and obvious aesthetic differences. While the "7s Plus" model boasts Apple's normal thick "chin" and "forehead" bezels, the "iPhone 8" bezels are almost nonexistent. Notably, Winget's "iPhone 8" sports white bezels, contradicting recent reports that Apple intends to limit front face color options to black when the device launches. Whether the company plans to release a version with white bezels, as is available on certain iPhone configurations, is unclear. A second video from Techtastic, also posted today, reveals what appears to be an "iPhone 8" chassis and front screen assembly. Both the chassis and front face are done in black, consistent with recent rumors. Not much can be gleaned from the video, but it does give a sense of what the device might look like in a user's hand. Closer inspection of Winget's mockup and the Techtastic unit shows both dummy models are identical to parts featured in today's image from leaker Sonny Dickson. Further, a separate "leak" on Wednesday featured a gold copper colored "iPhone 8" showing the same "CE" and battery disposal indicia. Considering the timing and apparently identical markings, each of the components seen today seem to originate from a single source. Apple is expected to debut "iPhone 8" alongside incremental changes to the iPhone 7 series at a special event in September. The new flagship smartphone is thought to include new and exotic technologies never before seen in Apple's product line. A number of these features, including facial recognition, 3D-sensing cameras, a home button-less display, high-definition video recording, "SmartCam" photo and video capture, and more, have been all but confirmed by Apple's inadvertent release of HomePod firmware late last month.